If you went to my college, this was a lunchtime tradition. Whether it was a Cape Town thing, a broke college student thing, or perhaps just a CTI College thing, we shared gatsby’s when we had our break between lectures and it was glorious. Sometimes you’d just opt for the plain slap chips variety and other times, slicing viennas (that’s hotdogs) into it was just what you needed, but the polony option was almost always the way to go. This recipe is super easy and it’s really kind of fun having people share a foot long, stuffed sandwich – and who can deny how authentically South African it is! Start by heating the olive oil in a skillet over a high heat, while you shred the lettuce and get your foot long ready. Once the oil is ready, brown your polony/lunch meat slices – this should take around 2 minutes per side. While it’s going, mix together kechup and hot sauce to your taste. 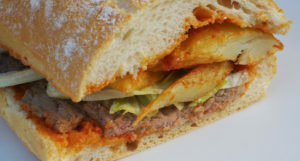 When the meat is ready, layer it into your baguette, top with hot fries (store bought or prepared in advance) and drizzle your spicy sauce onto it. Top with lettuce and serve. Slice it into four for a true South African taste!